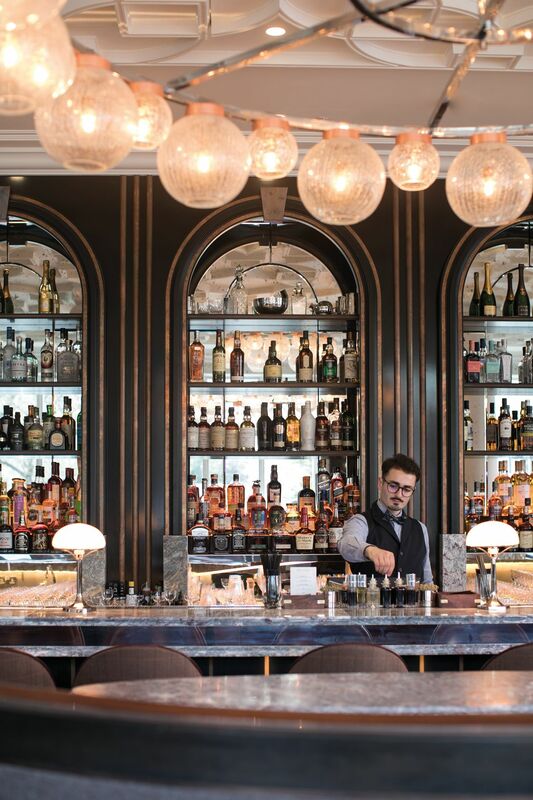 They may no longer serve hock and seltzer – Oscar Wilde’s beloved aperitif – but the literary dandy’s influence looms large in the Belmond Cadogan Hotel, which reopened in March after a four-year, US$48 million renovation. It was, after all, both Wilde’s residence and where he was eventually arrested in 1895, the events of which inspired poet John Betjeman’s The Arrest of Oscar Wilde at the Cadogan Hotel. 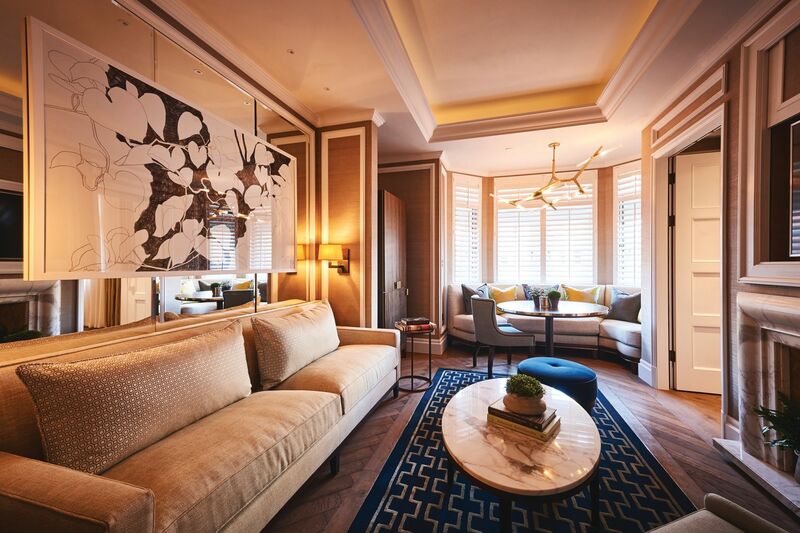 Now under the aegis of LVMH (which acquired Belmond in December), Belmond’s first London flagship has been painstakingly finessed as a hotel worthy of its location’s impeccable pedigree, while paying homage to the bohemian flair epitomised by icons such as Wilde and Lillie Langtry, a socialite and royal paramour who lived in one of its adjoining townhouses. The duo’s free spirit was reborn in the Swinging Sixties and ‘70s, when girls in Mary Quant minis would saunter down nearby King’s Road, home to punk legends and achingly hip boutiques. 20 years on, the ‘supers’ – Naomi, Cindy and their mononymous ilk – would escape the paparazzi by retreating to the Cadogan for a hot cup of tea. Despite its star-studded past, the revamped 54-key Belmond Cadogan whispers, rather than shouts, luxury, with its discreet brand of modern opulence. A sensitive renovation of its five 19th-century Queen Anne-style townhouses (at the junction of Sloane and Pont Street) ensures its appeal among its well-heeled clientele, while retaining the feel of an insider’s luxurious bolthole, a perfect retreat after a day spent traversing nearby Harrods, Harvey Nichols, Sloane Street or Chelsea’s many galleries. 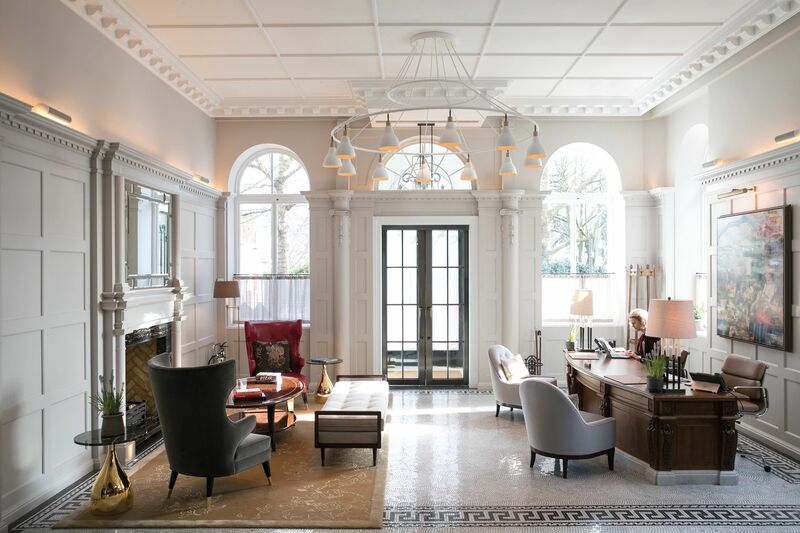 The light-filled lobby is more elegant home than hotel, with its cosy fireplace, wooden stairs and oversize contemporary artwork, depicting Sir Hans Sloane and his daughter Elizabeth (founders of the Cadogan Estates), and abstract, gold-inflected paintings tracing the Silk Road. These are part of the hotel’s 400-strong collection of contemporary art, most of which are by young British artists. 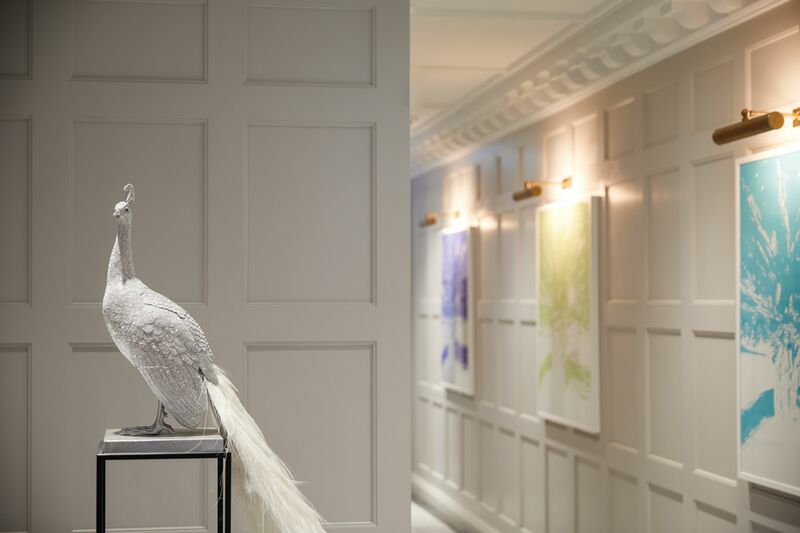 Each of the guestrooms also features a statement piece by one of five female British artists, who were commissioned to create artwork inspired by the adjacent Cadogan Gardens. You sense Wilde’s presence everywhere you look. There’s a specially commissioned alabaster peacock (named Oscar) wildly bedazzled in 25,000 Swarovski crystals. And the countless books: 600 of which were cast in bronze for the lift lobby, and the varied reading selection in every room, thoughtfully assembled by John Sandoe Books, one of London’s most beloved independent bookstores located in nearby Blacklands Terrace. Wilde’s bedroom (Room 118), has been subsumed into the sumptuous yet intimate-feeling Royal Suite, which has a charming, curved sitting area with views of the gardens, a fireplace, private terrace and a Wilde-worthy, bold-veined marble bathroom overlooking the surrounding streets. 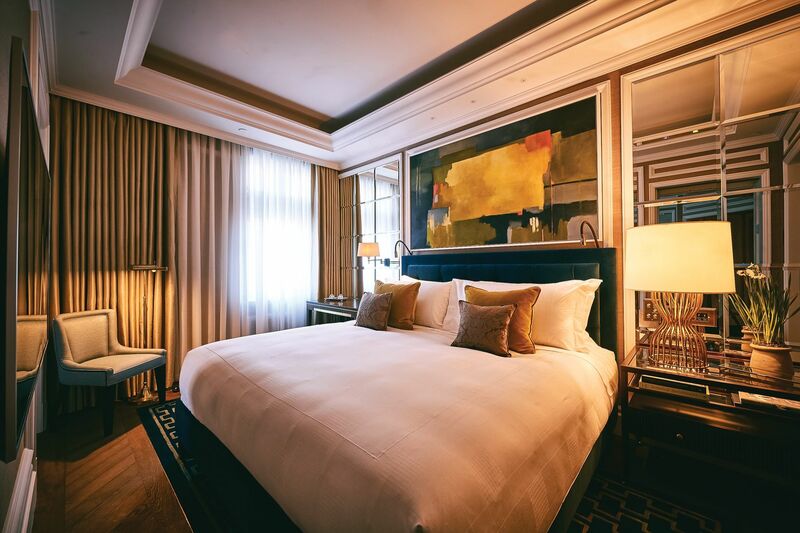 The other guestrooms (from US$620 per night) are similarly tasteful yet undeniably plush with luxuriously soft king-sized beds, wood tables, silks, velvets and marble bathrooms adorned with Bamford amenities. Mornings bring the paper in a smart leather sleeve and a petite bottle of milk, while nightcaps await in the custom-blended cocktail selection in the mini bar. Guests also gain exclusive access to the private Cadogan Gardens, two large rectangles of green where they can stroll, play tennis, or enjoy the simple thrill of watching robins and other native birdlife flit between sun-dappled branches in the heart of London. Despite my stay during opening week, service was already assured and precise, overseen by hospitality veterans such as general manager Klaus Kabelitz (formerly from The Berkeley and Claridge’s) and head concierge Toru Machida, wooed from the Savoy. All the staff wear bespoke uniforms that reference the area, from the fire-engine-red doorman’s coat inspired by the Chelsea Pensioners, to the Punk-inspired strong checks and mod details which pay homage to Mary Quant, whose elemental designs we gain a deeper appreciation of at a private viewing of a yet-to-open exhibition at the nearby Victoria & Albert Museum. The inner workings of Belmond Cadogan’s sublime effortlessness, however, will remain known only to its staff. “We try not to delve too much into what happens behind the scenes, into what should be magic,” a spokesperson demurs, when asked whether they would consider filming a documentary in the style of Inside Claridge’s. Langtry’s former home, meanwhile, has been converted into a private entrance, the botanical mosaics carefully preserved. Parts of her dining room have also been recreated in the hotel’s smart bar, which is overseen by Adam Handling, a rising star who also presides over the intimate Cadogan Lounge and accompanying eponymous restaurant – Adam Handling, Chelsea. Named one of “30 under 30 to watch” by Caterer magazine, Handling started at Gleneagles at just 16, and is a critically lauded Masterchef alum who runs two extremely popular restaurants in Hoxton and Covent Garden. His bookish demeanor, full sleeve tattoos and a quiet, yet steely confidence are a study in contrasts reflected in his cooking. “I don’t want to cook what I think people are going to like – I want to cook what I like. When you come to a restaurant, you want to see what this person is about,” says Handling, a “Best of British” advocate who specialises in seasonal, sustainable cooking. Dinner commences with his signature ‘snacks’, including warm truffle cheese doughnuts and some seriously addictive chicken butter. The latter is a light-as-air whipped butter infused with chicken juice and topped with crispy chicken skin bits which you slather over the very good house-baked sourdough – a flavour bomb I would happily call dinner any day. If you come for the chicken butter, stay for Handling’s deceptively simple, yet deftly creative dishes. 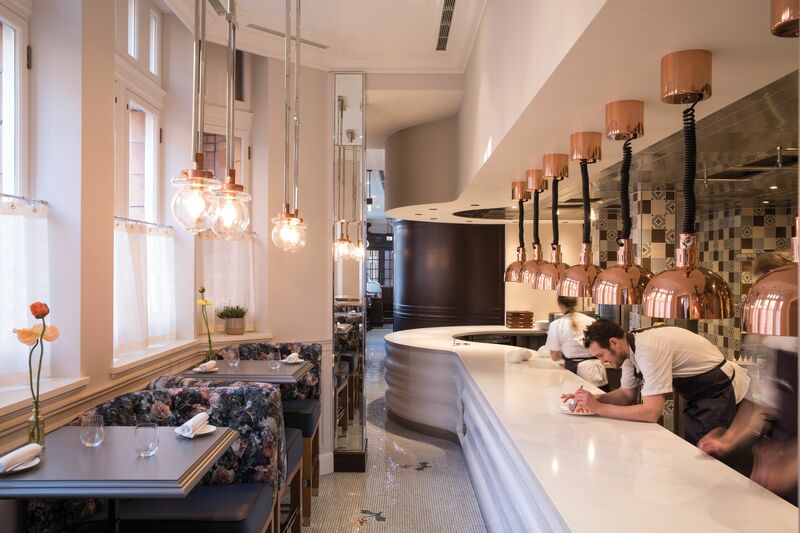 Standouts include a butter-poached King crab dressed with confit carrots and sorrel, as well as a beautifully tender wedge of Scottish beef from Highland cows, which are, in the proud Scot’s words, “treated very well, and slaughtered only when they are ready”. Family is a key ingredient in all that Handling does: the idea for chicken butter came from a fussy sister and leftover chicken and baps (bread rolls), and his grandmother knitted all the brightly coloured tea cosies used in afternoon tea. Mama Handling gets a nod in his signature starter named “Mother”, an alcoholic version of which is available at the bar. A new Town & Country – The Best of Britain with Belmond package (from £2,290 per couple) allows guests to continue their culinary journey at Michelin-starred Le Manoir aux Quat'Saisons in Oxford, Raymond Blanc’s countryside temple of haute cuisine. After a day spent exploring Blanc’s famed organic kitchen gardens (which grow among other things, 150 varieties of apples, 20 varieties of pears and uncountable vegetables), then treating yourself to an perfectly executed sybaritic feast officiated by Blanc himself, you’d be hard pressed to find a more logical arrangement. LVMH agreed to acquire Belmond in a deal valued at US$2.6 billion last December, in a highly anticipated deal that saw the latter’s stock soaring prior. The deal, which is LVMH’s largest since its acquisition of Dior last year for over US$7 billion, will see the French luxury conglomerate significantly boost its high-end hospitality offerings, which include Bulgari Hotels & Resorts, as well as its Cheval Blanc properties in the Maldives, Courchevel, Paris and St Barthelemy. Belmond, previously known as Orient-Express Hotels, operates in 24 countries with its unique portfolio of 46 hotel, rail and river cruise experiences. The deal is said to represent LVMH’s response to slowing demand in China, an uncertain luxury market, and the burgeoning increase in demand for experiential luxury travel (estimated by Belmond to grow annually at a rate of 7-8%). Belmond has been effective at tapping this growing category of travel, with its market-leading train journeys such as the Venice Simplon-Orient-Express, or hotels that offer unforgettable experiences, which can include being blessed by village shamans in a Laotian baci ceremony, discovering Venice’s secret lagoon wineries or getting a private caviar masterclass led by an expert. The acquisition could also signal new ways to showcase and market LVMH’s considerable range of luxury offerings, from brands such as Louis Vuitton, Fendi and Dom Perignon. Its Maldivian “concept store” in Cheval Blanc Randheli, for example, is less resort shop than elegant boutique, stocking the likes of Pucci caftans and Hublot watches exclusively designed for the resort.